Yes, I know I should be writing more posts about my journey as a writer, and pass on my writing experiences to others. However, sometimes life throws a large stick in-between the spokes of your wheels, which then demands most of your attention unless you want to fall on your face. And such a stick was thrown at us a few months ago when our beloved fur-baby "Zoey" became gravely ill.
After spending several days at an animal hospital, with IV fluids and medication, plus a blood transfusion, we were finally able to bring our girl home in stable condition. Now, she had to take several medications and said meds had to be taken with food. The problem we now faced...this once food-motivated dog no longer showed any interest in eating. She snubbed treats of any kind, and her usual food nor the old standby of chicken and rice did not elicit any interest from her. What to do? Then I remembered an old recipe my grandmother used to whenever a furry companion was ill...Bone Broth! I've never heard of Bone Broth. What is it? Bone broth is a nutrient-rich stock made by simmering raw bones, with or without meat, at low heat for a long time. The resulting broth is packed with vitamins, minerals and amino acids. 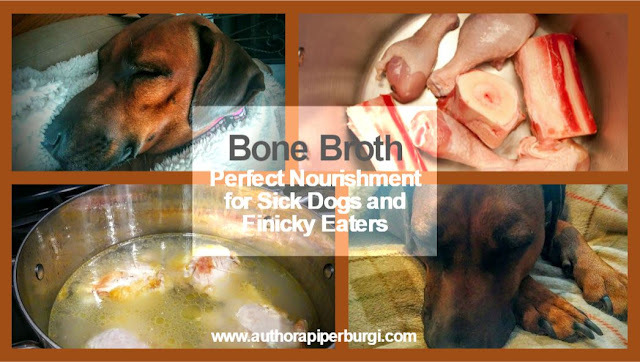 Bone broth is the ideal food for sick and recovering dogs, as well as finicky eaters. It is easy to digest and soothes the digestive tract. Commercially available chicken/beef broth or stock from the grocery store does not compare to a homemade broth. The pre-packaged stock, found in grocery stories is cooked at high heat for a short time, then processed, chemicals and preservatives added, and packaged. Homemade bone broth is cooked over low heat, for several hours and does not contain unnecessary ingredients. Sounds like a lot of work. Are there any benefits to Bone Broth? Even in my grandmother's days and before, bone broth has been used in cases of digestive issues, and get dogs that refuse to eat altogether eating again. It can also benefit canines with food allergies and sensitive stomachs. It certainly helped us many times when our two epi-warriors, Lana and Darren had their stomach issues. Not to mention that healthy dogs love it, too. So, it's good for dogs. But how do you make Bone Broth? This broth is super easy and inexpensive to make! All you require is a stockpot full of water, a spoonful of apple cider vinegar, and enough raw bones to cover the bottom of the pot. That's it! While you can use nearly any kind of bones, I prefer pieces of turkey or chicken bones with meat or beef marrow bones; they all make great broths, and the meat that just falls off the bones during the cooking process makes for a great snack. If you do not have apple cider vinegar on hand, feel free to use regular white vinegar or lemon juice as a substitute. The added acid helps draw the nutrients out of the bones. - Fill the bottom of a large stockpot with a layer of raw bones/meat. - Add water until the bones/meat are thoroughly submerged. - Add one tablespoon of apple cider vinegar. - Bring everything to a boil. - Once boiling has been achieved, reduce the heat to a simmer, and let it cook for at least 4 to 6 hours, and up to 16 to 24 hours. Don't forget to add water as necessary! - When the broth is done, remove bones, skin, left-over cartilage and dispose of it. - Keep the left-over meat as treats or a welcome addition to daily meals. - Once the broth has completely cooled, it can also be frozen. This bone broth certainly did the trick for our fur-baby, and she's expected to fully recover from her ordeal. 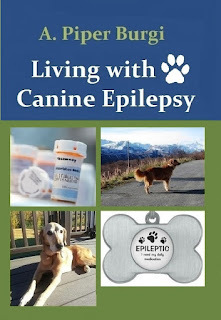 How do you get your furry companions to eat when they don't want to eat? Do you have any tips/tricks you'd like to share? I'd love to hear from you!